A CCCA member from Denver with whom I had been acquainted with for 15 years had placed the ad. I called Terry about the car the following weekend. I will not buy a car that I cannot see, and touch, and drive. This was mid-November of 1997, and we were unable to make our schedules match until late the following February. I had scheduled a business trip in mid-January, but Terry said he would be in Scottsdale. I rescheduled the trip for late February. When I called Terry in late January to tell him when I would be able to get to town, he told me that the car had been sold. 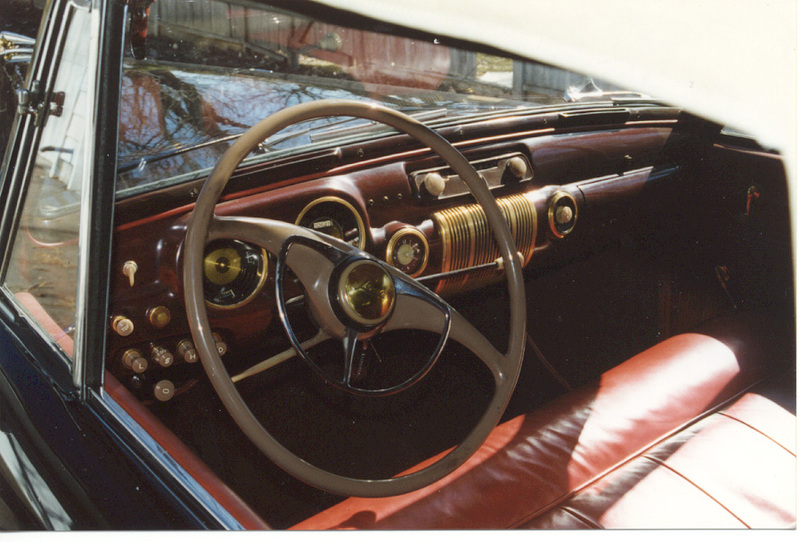 Then he said: “But I have something else you might like.” Something else was a black 1941 Lincoln Continental Cabriolet, with a tan top and red leather interior, radio, hot-air heater, and a Borg-Warner overdrive. When I got to Denver on February 22nd, I found a straight, clean, well-running car. I spent an hour crawling under, over, around and through the car. I then drove the car for an hour. The conversation in which we settled on the price was almost an anti-climax. I left a deposit, and continued on to Portland, Oregon. What I found when I got to Denver. It took a few weeks to push the necessary paperwork, and make arrangements to have the car shipped east. The car ran well enough that I was contemplating driving her home, and I had several people volunteer to come with me. Then reason set in. Terry had driven the car 500 miles in the preceding six years, and I realized that I would be begging for problems during the 1700 miles between Denver and Washington. I knew that there were things on the car that were going to need attention, and I decided that I would rather fix them in my driveway, rather than the side of Interstate 80 in the middle of Nebraska. As it turned out, that’s about exactly what would have happened. Cut to the second week in April, and a large green truck appeared in the street in front of my house. One hour’s worth of unloading later, my car slowly crawled into sight on the tailgate lift. With all four wheels firmly on the ground, the get-acquainted period began. I started to drive the car around the neighborhood. The tires on the car looked good, but I had no idea how old they were. Since I intended to drive the car in the highway, the first item on my shopping list at Spring Carlisle was a new set of tires and tubes. With new treads in place, I began to drive the car in earnest. A friend up in Clarksburg has a hoist, so I took the car up there for maintenance. I pulled all four wheels and repacked the bearings, changed the oil, and greased the chassis. The next trip was to another friend’s shop in Frederick for work on the cooling system. We got to within one mile of his shop, and we began to smell gasoline, and the engine began to misfire. The car died at the top of my friend’s street, and we coasted into his driveway. I took the bowl off of the fuel pump, and found copious amounts of brown gunk in the pump. With this cleaned out, the car again started and ran, for a while, anyway. I then replaced the radiator hoses and thermostats, and proceeded to flush the cooling system. Halfway through the flushing process, the engine again died, and would not restart. My friend vanished into his shop for five minutes, and came back out with a freshly rebuilt fuel pump and a new pushrod. With the new pump installed, the engine again started and ran. Throughout all of the maintenance work, however, I was not able to fix the overdrive, which shifted only intermittently. I was planning to attend the Lincoln Zephyr Owners Club/Lincoln Owners Club meet scheduled for the first week of June in Burlington, Ontario (a suburb of Toronto). On the day of departure, I had been to the locksmith for spare keys, and was in the process of packing the trunk, when I noticed that both of the water pumps were piddling coolant on the driveway. Two frantic calls to friends somewhat assuaged my fears that the car would not be able to make the trip. A friend and I nervously departed at 6pm into a rainstorm, not knowing if the car would make the trip, or not. Without a working overdrive, our speed was limited to 50 mph. We didn’t get there quick, but we got there. I also discovered that the top leaks a bit of water across the windshield header, and one of the windshield wipers flopped around without wiping very effectively. We met other friends for dinner in Dillsburg, PA, and put in for the night in Harrisburg. The next day found us heading up US 15 into New York State, and our next stop in the Finger Lakes Region. We visited a fellow LOC and CCCA member who is currently restoring a 1917 Locomobile, and who was also heading to Burlington the next day with a 1931 Lincoln Model K. Our overnight stop was in Canandaigua, where we had dinner with another Lincoln enthusiast, who owns a 1953 Lincoln Capri convertible. The next morning, the two-car caravan headed to Lockport, where we were joined by two more ‘53 Lincolns, and we proceeded across the border at Niagra Falls and on to Burlington. The combined LZOC/LOC meet was very well done, drawing 60 cars from the Midwest to New England. 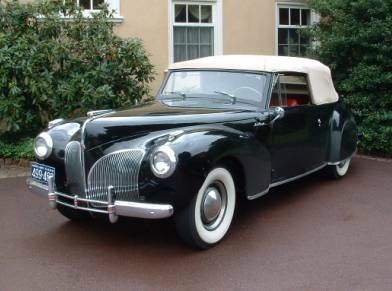 There were 20 Model Ls and Ks, and 30 Zephyrs and Continentals. While at the meet, I attempted to repair the overdrive, installing a set of bypass wires. On the drive home, the overdrive did work, but not every time I wanted it to. We did made the drive home in one day, however. I was absolutely thrilled when we pulled back into my driveway. The trip was 1000 miles, and the car consumed two gallons of water (leaking water pumps, remember), and two quarts of oil. She started hot or cold, had good oil pressure, ran cool (except when climbing hills), and got 14-15 mpg. While in Canada, I had received several suggestions regarding the cranky overdrive. The first was to replace the overdrive wiring harness, the second was to flush the overdrive’s internal lubricant. I had begun to order new wiring for the car, and the overdrive harness was the first to arrive. I then used ATF to flush the old grease out of the overdrive, and replaced it with fresh gear oil. This helped considerably, but did not completely cure the problem. The next trip was a short one, to Baltimore, for the Grand Classic in July. The car ran wonderfully, and the meet was great, even if I still had mud marks on my whitewalls (my garage had flooded). The big trip of the summer began in August. I had been contemplating flying out to the Midwest to attend the LZOC Mid-West meet in Milwaukee. 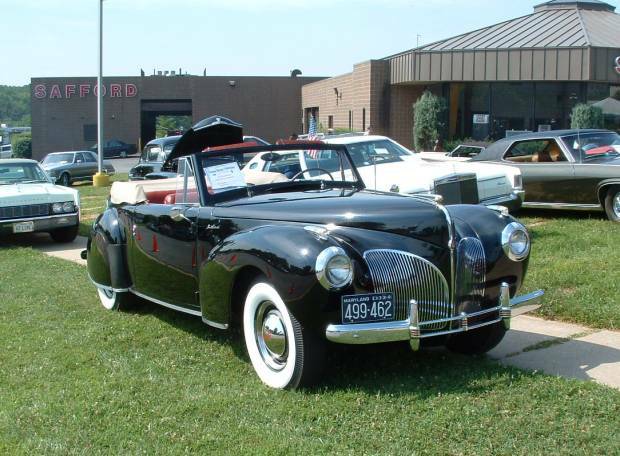 A friend in Chicago suggested that I drive the ‘41 out for the Zephyr meet. I was also planning on taking the car to the Lincoln Continental Owners Club meet in suburban Chicago in September, and didn’t have enough time for two round trips. He offered to store the car for me in between the two meets, and that made the difference. So, off I went, departing at noon on a pleasantly cool Wednesday, with the top down. The sun set about the time I was passing Cleveland, and it soon became a bit brisk, so I finally put the top up. My overnight stop was near Toledo. The next day, I encountered the traffic on the south side of Chicago on my way to the rendezvous at the Lake Forest Oasis on the Tri-State tollway. 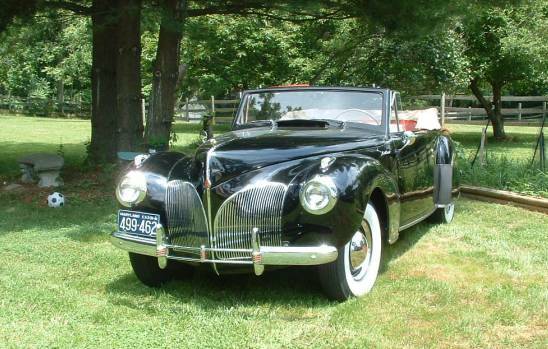 The sight of the three of us caravanning up I-94 to Milwaukee was spectacular (one friend has a ‘48 Continental Cabriolet, the other a ‘48 Continental Coupe). The LZOC meet drew more ‘41 Continentals (eight) than I had ever seen in one place before. I received the award for the longest distance driven in an H-V12-engined car. With the meet over, we three returned to Chicago. I dropped off the car, and caught a plane back to DC. After the LCOC meet ended, it was time to head back home. The trip took two days, as I decided to stop over in Ohio to see some friends. The temperatures were in the upper-80s and low-90s, and the only time the car was unhappy was in climbing a couple of those long uphill grades on the Pennsylvania Turnpike. The total round trip was 1800 miles, and the car used one quart of oil. With the overdrive working (most of the time, anyway), the highway mileage climbed to 18mpg. After returning from Chicago, I was asked to display the car at a Frank Lloyd Wright commemorative festival at the Pope-Leighey House at Woodlawn Plantation. Mr. Wright had owned both a '40 and a '41 Continental, and I got to hear his grandson talk about driving one of the cars from Arizona to Wisconsin sometime in the 1950s. Next was the Rockville Car Show the week following Hershey. I had joked about wondering if the car would go that far, as the show was only 3 miles from my house. Two weeks later, I drove the car to the Fair Hill Equestrian Trials way up north of Baltimore. A couple of weeks later, a picture of the car appeared in Old Cars Weekly. The last time we were on the road together was to attend the CBR Christmas Party on that wonderfully warm day in December. I remember waking up that morning, pondering what I was going to drive to the party in. When I stepped outside, I didn’t wonder any more, and I knew that the top was going to be down, too. And now she’s down for the winter’s maintenance work. The ’41 traveled 4,000 miles in 1998. This was more miles than I drove both of my modern cars combined over the summer. I had a great time doing it, but I wonder how I’m going to explain this to my insurance company? Since this article was written, I began taking the car apart to replace the all the wiring. The wiring under the hood looked okay, but the wiring under the dash was, well, fugly. I also wanted to replace the vent window gears that were stripped, and repair the windshield wiper that didn't wipe very well. Then things began to get in the way. It's been over two years since the car was last on the road. I have finally resumed work on the car and hope to have it running again before the end of this year. The above statement was written sometime in 2001. I didn't make that deadline, either. The car continued to sit into 2002. I went to Europe for five weeks in May. When I returned in early June, I was out in the garage connecting batteries, and checking to see that nothing had been disturbed while I was gone. 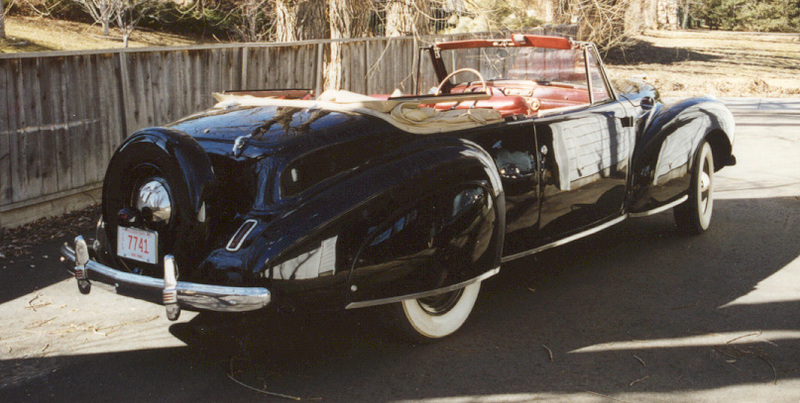 I took a long, hard look at the '41, thinking that I just didn't have that much to do to the car. I began thinking that if I didn't do something to the car right then, I never would. My goal for the remainder of the summer was to spent one or two hours per day, and five or six days per week, working on the car. The re-wiring was largely completed in mid-September. I say 'largely' because there are two pieces, the stoplight harness and the battery ground strap, that have not been installed. I have the wiring, but cannot remember where in the garage I put them. I have finally found the missing harness, but the weather (cold and snowy) has done of wonderful job keeping me out of the garage. I also need to replace the overdrive solenoid, as the overdrive has again evidenced a lack of willingness to shift when asked. The last time the car was on the road was early in December. 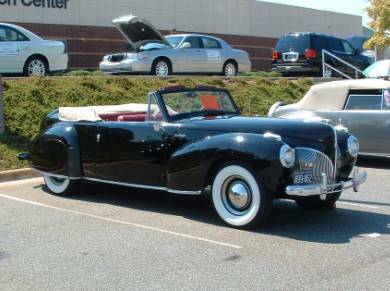 I took the car out for a 200 mile drive last weekend, attending a Packard Club event at the Speedwell Garage in Parkton, Maryland. The overdrive is still sometimes reluctant to shift, but it did so often enough to make the highway portions of the drive pleasant. At the Speedwell Garage, Parkton, Maryland. I have received an invitation to display the car at the Radnor Hunt Concours d'Elegance in September. Time to spiff up the paint a bit. I ran the car in a Memorial Day parade in Virginia. I had been assured that the parade would keep moving throughout the route. Right. We would sit and start and sit and start. I watched the temperature gauge slowly climb up to the hot mark. I was about ready to pull over to the side of the street and shut the motor off when the car stalled and would not restart. We finished the parade courtesy of six leg-power. At the end of the route, we pushed the car into a parking lot and waited 15-20 minutes for the engine to cool down. She restarted regularly and seemed to run okay, until I tried to drive home. The car idled terribly and had no power. In checking the problem, I discovered the spark plugs in the right bank looked fine, but the plugs in the left bank were all sooty. I first replaced the ignition condensers, but the engine ran as poorly as before. I then replaced the carburetor, which made a significant difference. At the Grand Classic in Ellicott City, July, 2003. The car was entered in the CCCA Grand Classic in Ellicott City, and I ended up making two round trips to the host hotel. During one of these trips, the overdrive made a “crunch-bang” noise and began to shift every time I asked it to. No, I don't know what happened, but I ain't complaining. We did a fair bit of traveling this month. 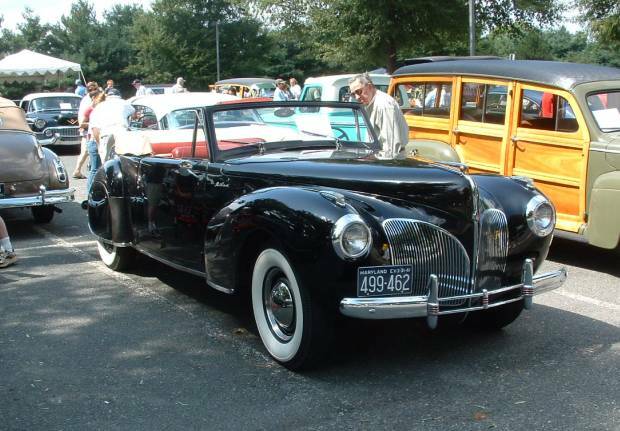 First, the ’41 was entered in the Radnor Hunt Concours in suburban Philadelphia. 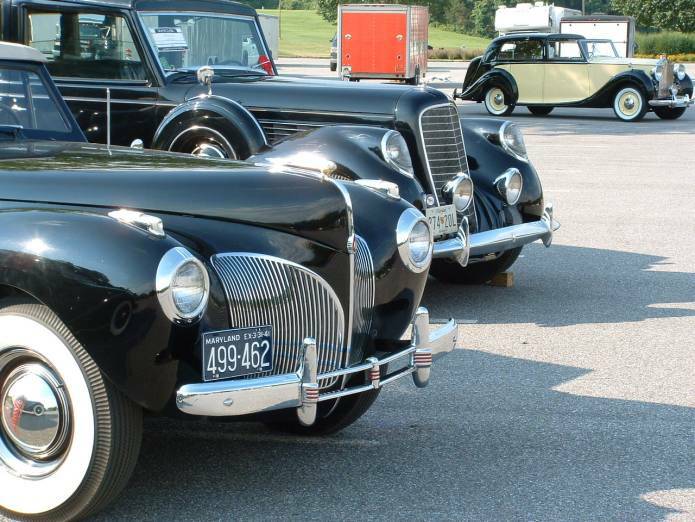 The following week, we were off to Hickory, North Carolina for the LCOC Eastern National Meet. Taken at the Radnor show (L), and at the LCOC Hickory meet (R). 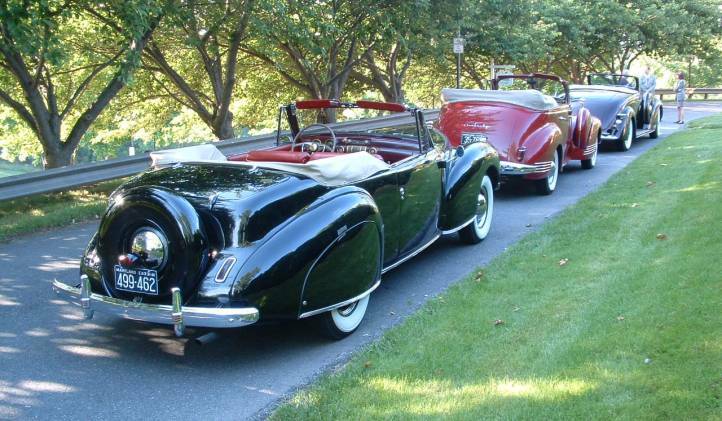 I received a call in early June asking if I could provide some old cars for a fund raising dinner for the Crohn’s and Colitis Foundation being held at the Glenview mansion here in Rockville. This is the first time I’ve ever had all three cars away from the house at one time. 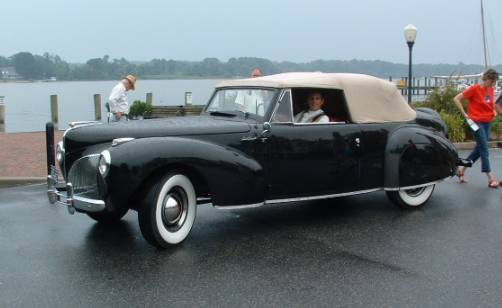 I drove the Continental over to the Eastern Shore to attend an RROC July 4th party. In looking at the photo, I sometimes forget just how good the car really looks. There was a walking tour of Chestertown, during which it rained. Our tour guide asked if he could have his picture taken in the car. Here he is. On the way home, the overdrive began to act up again. Drat. A week later, we were out again, to attend a local LCOC show at Safford Lincoln-Mercury in Silver Spring. I have not had the Continental out much the past few months. I had intended to drive her up to Vermont for the LZOC meet this month, but the long-range weather forecast (hot, muggy, rain, rain, rain) proved to be a powerful deterrent, and I drove modern. We did get out for the Chesapeake Bay Region, CCCA’s Coming-Out Party in June. It looks like Baby will be very reluctantly be going to a new home. Details at Eleven. Well, I was wrong. 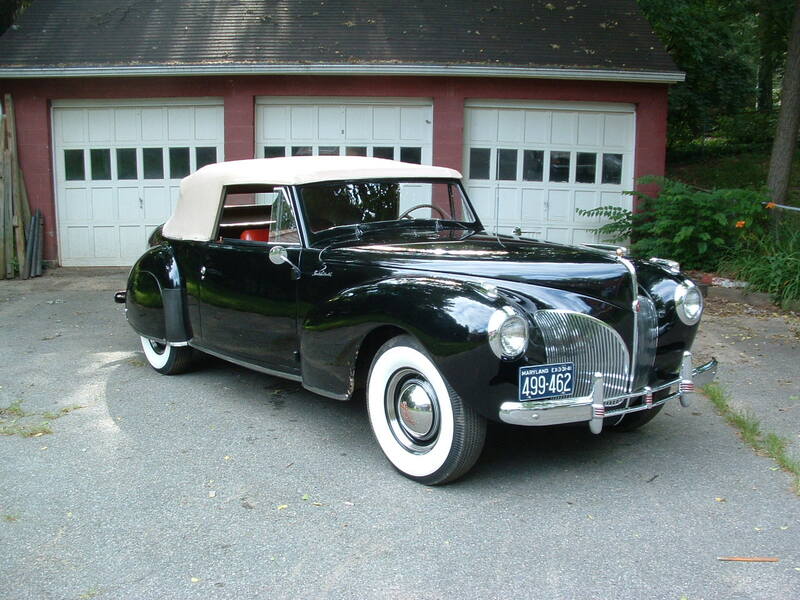 With the impending purchase of the 1936 Lincoln, one of the existing toys had to go. 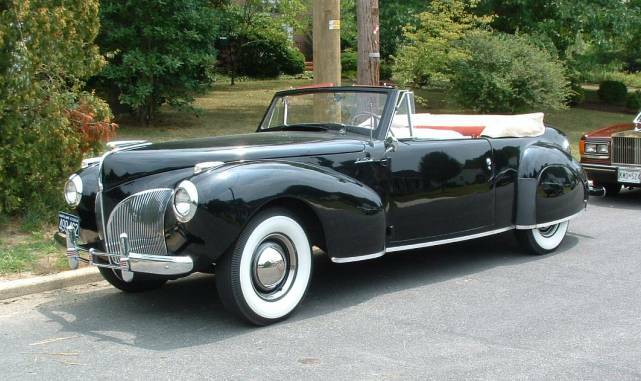 I was having a very hard time in deciding whether to sell the Continental of the Packard, so I put both up for sale. 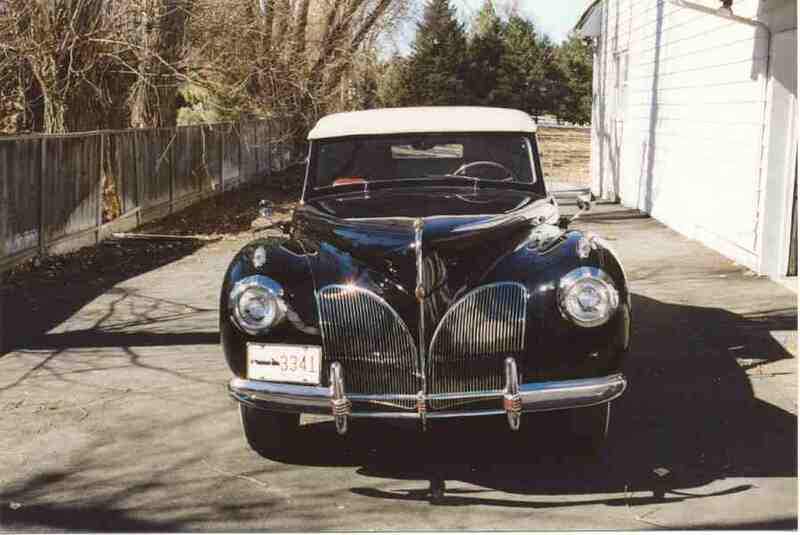 The Packard recently went off to a new home, and I get to keep the Continental.